William Addison became director of the Chess Room at the Mechanics Institute in 1965. 1964-1967 saw more sweeping victories for future grandmaster Duncan Suttles. Paul Quillen got out of prison for long enough to win several important events. Jacqueline Piatigorsky organized a Second Piatigorsky Cup in 1966 with ten of the strongest players in the world competing. Two major events new were established: The National Open in Las Vegas started in 1964 and the American Open in Los Angeles stated in 1965. Both are still being played annually today. 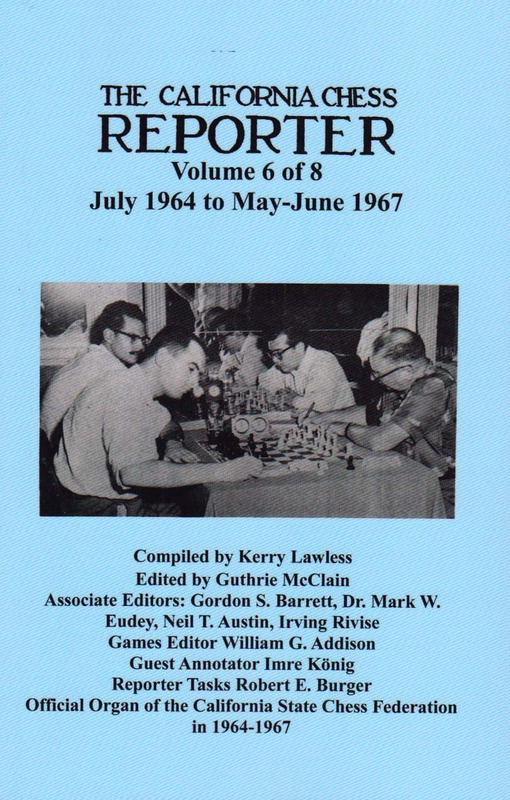 Cover Photo shows Tibor Weinberger (front left) playing Henry Gross in the game for the 1959 California Open Championship. Henry Gross had won his first five games and only needed to draw this game with white to clench the state title. Instead, he played too cautiously and Weinberger won the game in the title. In the background, Roger Smook (left) plays Gil Ramirez. The winner would have tied for first, but instead the game ended in a draw.